The VP-1608 16x8 RGBHV/Audio Matrix Switcher from Kramer is a high-performance matrix switcher for use with RGBHV and balanced audio signals. This solution can route any or all inputs to any or all outputs simultaneously, making it an ideal solution for presentation and production applications. By employing delayed switching and changing sync ahead of video, this unit ensures nearly glitch-free switching of non-genlocked sources. A take button allows for the execution of multiple switches at once, audio breakaway switching is also a standard feature, and memory locations store multiple switch presets to be recalled and executed as needed. Control of the system is managed through the unit's front panel (which features a control lockout security feature), or the included Windows-based control software. The system comes ready to manage up to 400MHz of bandwidth. It also features a standard 19" width and 3U height to accommodate easy rack placement. 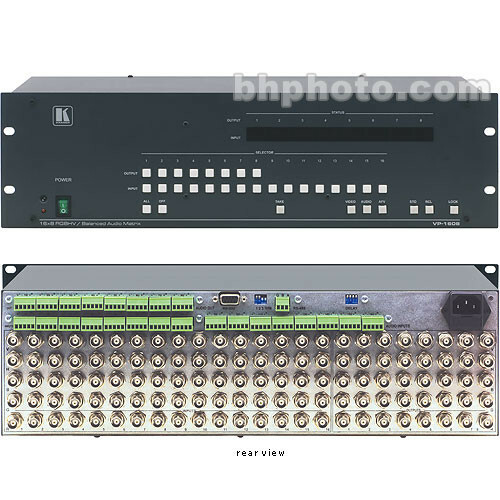 This unit is designed to serve as a high-performance matrix switcher for use with RGBHV and balanced audio signals. Audio can be routed separately from the video as needed. Balanced audio provides the highest quality signal possible. Execute multiple switches at once with this unit's take button. This unit allows you to store multiple switch presets that can be recalled and executed as needed. Manage your system with the included Windows-based software control package. This unit is designed to fit into a standard 19" rack and occupies only 3U of rack space. Dimensions (WxD) 19 x 7"
Box Dimensions (LxWxH) 21.5 x 12.0 x 8.0"